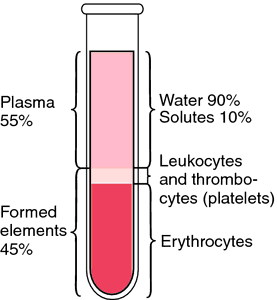 the total quantity of blood in the body. The regulation of blood volume in the circulatory system is affected by the intrinsic mechanism for fluid exchange at the capillary membranes and by hormonal influences and nervous reflexes that affect the excretion of fluids by the kidneys. 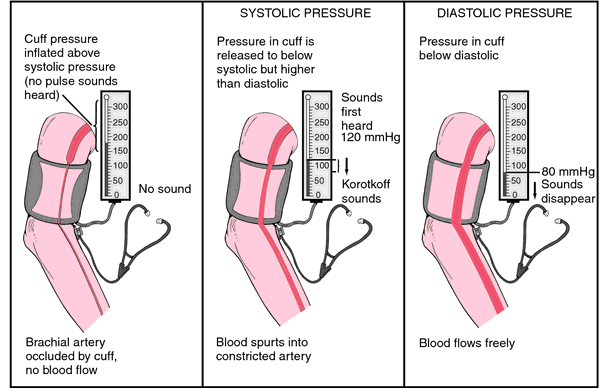 A rapid decrease in the blood volume, as in hemorrhage, greatly reduces the cardiac output and creates a condition called shock or circulatory shock. Conversely, an increase in blood volume, as when there is retention of water and salt in the body because of renal failure, results in an increase in cardiac output. The eventual outcome of this situation is increased arterial blood pressure. Measurement of blood volume is accomplished by using substances that combine with red blood cells, for example, iron, chromium and phosphate, or substances that combine with plasma proteins. In either case the measurement of the blood volume is based on the 'dilution' principle. That is, the volume of any fluid compartment can be measured if a given amount of a substance is dispersed evenly in the fluid within the compartment, and then the extent of dilution of the substance is measured. caused by uncompensated blood loss, dehydration, water deprivation.